Thoughts from the developers about bookmarks, sometimes, where we're headed. The Delicious, aka del.icio.us bookmarking service has undergone several ownership changes, and during the last year the site has often been not working. Last year at this time, we were fielding support requests from Delicious users. After testing, we responded by saying Yes, it looks like Delicious is down again. There is of course nothing we can do to fix that. We’ve now learned that, indeed Delicious is gone. A .bkmslf file opened in version 2.5 or later will automatically be deleted from the disk and replaced with a new .bmco file package. For BookMacster, if it resided in the default Bookmarkshelf Documents folder, the corresponding .bmco file will reside in a new Collections folder. Like the old Bookmarkshelf Documents folder, the new Collections folder also resides in ~/Library/Application Support/BookMacster/. The new file format plays nicer and more efficiently with recent versions of macOS. It is a file package instead of a flat file, its SQLite store now supports write-ahead logging. Instead of using Apple’s notoriously problematic NSPersistentDocument, it is based on BSManagedDocument. It has adopted Apple's asynchronous saving. My thanks to whomever it was at Apple who decided, in macOS 10.12 Sierra, to fix Bug 15499730 which I filed almost three years ago, in 2013 on Nov 18! This bug involves the non-Apple Status Items, colloquially called menulets, which appear in your menu bar to the right of center, provided by non-Apple applications, such as our bookmarks management apps. Until macOS 10.12 Sierra, the only way for a user to access these was by clicking them with the mouse, which was difficult for users with limited vision, and annoying for those of us who feel we work faster with the keyboard. 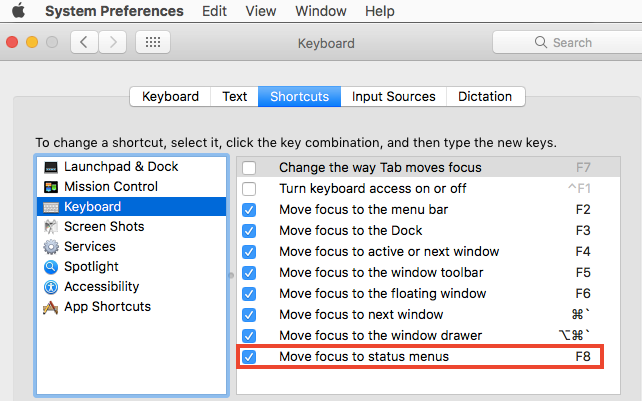 If you enabled a Keyboard Shortcut to to Move focus to status menus, as shown in the screenshot below, you could use your arrow keys to access the (Apple) Menu Extras, but not the (non-Apple) Status Items. But after upgrading to macOS 10.12 Sierra, it works for the Status Items too. Markster users, and BookMacster users, who use our Status Item to land new bookmarks directly, will appreciate it! As a developer, of course I always anxiously upgrade to the lastest beta macOS, forgetting that I’ll need to keep the older one around for testing our apps. Then, I need to install an older macOS on a different partition. The challenge is that, if you do the obvious thing and launch the “Install <earlier version>” app, a dialog will appear and tell you This copy of the ‘Install OS X/macOS’ applications is too old to be opened on this version of OS X/macOS – Quit. Arghhh. The following instrucions will work around that. First of all, understand that it is definitely necessary to have three volumes to do this. A “volume” is a disk “partition”. Volume N - The volume with the new version of macOS which you are currently running. Volume T - A “trampoline” volume which will become your bootable installer. This volume must be only big enough to hold the installer. This Volume T will be comnpletely erased during this process. I used a 8 GB thumb drive for Volume T.
Note that these three volume/partitions may or may not be on the same disk. If you try to use one volume for T and D, everything will proceed OK until it inexplicably tells you that your disk image is damaged and you should redownload from Apple, which will not help. This problem is no longer reproducible. For the last few weeks, iCloud Safari bookmarks syncing has been working OK for me. However, I don’t test it every day. In order to see recent bookmarks changes made on other devices in Safari on your iPhone or iPad running iOS 9, you must relaunch Safari (double-click the home button, then in the application switcher which appears, flick the Safari tile upward, then relaunch Safari). In iOS 9, when using iCloud Safari syncing, Safari bookmarks are not pushed from iCloud automatically, no matter how long you wait. They don't show up until you forcibly relaunch Safari. This was tested most recently in iOS 9.0.1 (Build 13A404). The accident was due to a quite high ridge in the pavement that runs parallel to the direction of travel. The only damage to me or my bike was a slightly sore shoulder that went away after a day, a loosened rear view mirror, which was kind of loose even before that, and another tear in the light cloth that I have clipped over my fairing to protect it from scuffs and degradation by sunlight. Have you ever done Auto-reverse engineering? A type of engineering work inspired by its progenitor, reverse engineering, which, as is well-known, describes the action of a company disassembling a competitor’s product in order to figure out how it works and learn some tricks. Auto-reverse engineering is the action of a company disassembling its own product, because its design was never documented, and the engineers who designed it have moved on. Building with 10.6 SDK in Xcode 6 - Still works! A job I’m working on requires that the customer's massive old project be built with the 10.6 SDK. After spending a few minutes with Xcode 3, I was thinking of walking out the door. Actually, it was more than a few minutes – I watched Xcode 3 beachball for eight and a half minutes doing a Find in Project (not frameworks, just Project!). I remembered the bad old days. But then I also remembered how, years ago, I’d copied the 10.5 SDK into Xcode 4, I think when I needed to build Bookdog. I remembered there were some issues, though, and eventually it was no longer possible. Realizing this was a much bigger stretch, in desperation I tried it again. I copied the 10.6 SDK from an Xcode 3 installation to Xcode 6.1 as described in this Stack Overflow article Amazingly, after 15 minutes of “indexing”, Xcode 6.1 Build Succeeded on this massive project, including CodeWarrior PowerPlant, using the 10.6 SDK, and the product launched and it works. Hey, I got 999+ warnings, but they were supposedly getting 700+ in Xcode 3. Hmmm, there were probably fewer issues with this than with Bookdog and 10.5, because back then we were dealing with the PowerPC thing and different gcc versions. Something I don’t say very often: Thank you, Apple, for not breaking this unsupported hack. I might recommend still doing the final production build in Xcode 3 on the old Power Mac, but at least now I can develop. • In the target that needs to load the framework, add to its Runpath Search Paths the relative path from the its executable, which in this context is called the loader, to the framework, denoting the starting point by the symbol @loader_path. It makes sense if you think about it! For the typical example of an application executable in Contents/MacOS which needs to load a framework in Contents/Frameworks, the answer is: @loader_path/../Frameworks. * It seems to me that the example Apple’s Dynamic Library Programming Topics > Run-Path Dependent Libraries > Using Run-Path Dependent Libraries, which says to use @rpath/MyFramework.framework/Versions/A/MyFramework, is either wrong or confusing. Four ducks perch on the bank of one of the ponds in the Oakdale / Farmer's Creek wetland in Lapeer, Michigan. A couple weeks ago, the geese left the area and for the last week or so, dozens of ducks like this were happily swimming and doing duck things in this pond, until a couple days ago when the temperatures became colder, rather early in the season, according to the local people I talk to. 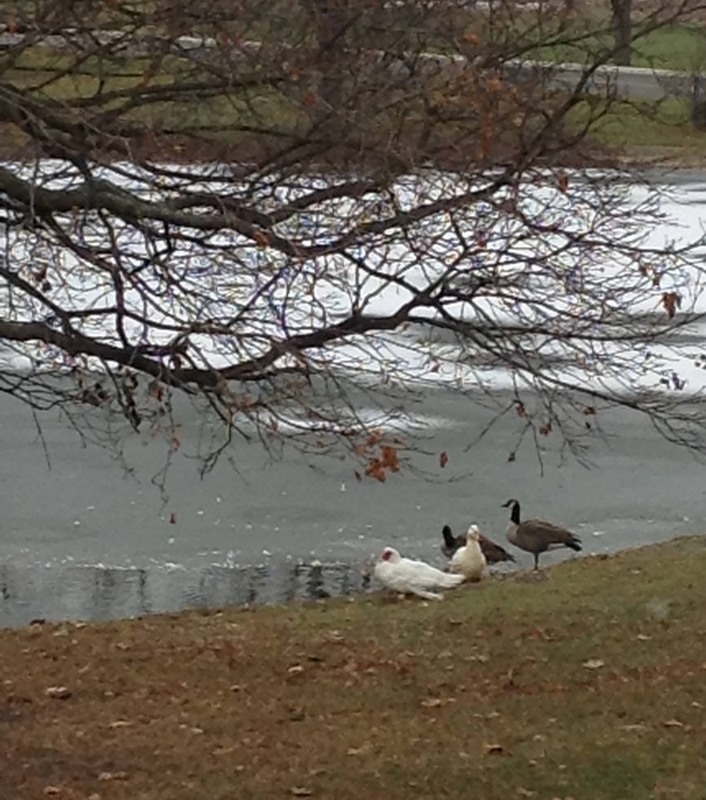 Today, you can see to the left of these four remaining ducks is the one small still-shimmering section of the pond which has not yet skinned over with ice. It is about 15:15 in the afternoon on Sunday, 2014 Nov 16. Overnight, this small section will certainly become skinned with ice also, and with temperatures predicted to average -5 Celsius from Monday night thru Friday, the whole surface will be frozen hard. I wonder what the ducks are thinking. This happened Saturday, 2014 Aug 16. • I received an email allegedly from Dropbox. • It says my Dropbox app is out of date. • Strange, because the Dropbox app updates itself, silently and automatically. • I check my Dropbox version. It is Dropbox 2.10.27. Is this the latest, I don't know? • By the way, I have Mac OS X 10.10 Yosemite DP5. • So I click the button. A web page opens, a download begins, disk image decompresses, Dropbox.app appears. • I double-click the decompressed Dropbox.app. Gatekeeper (Apple security feature built into OS X since late 2012) pops up a dialog, tells me that app is not allowed to launch because it is from an unidentified developer. Eeek! • I check the version of the decompressed app, (Contents/Info.plist). It says that it is version 1.0. Well, definitely that explains why it would not have been signed for Gatekeeper, if it is indeed Dropbox 1.0 which was published in 2010. But it also would definitely not be an update from my current version 2.10.27. Follow-up resources regarding my talk to the Advanced iOS/Objective-C/Swift Meetup at Sandbox Suites in Sunnyvale, California, the evening of 2014 Sep 09. Thank to all who attended! The project I showed to demonstrate Core Data Concurrency. Apple's Technical Q&A 1809 on Write-Ahead Lookup Journaling, added in OS X 10.9 and iOS 7, which causes Core Data persistent store files to be three files instead of one, and how to work around it or revert to the old behavior. Transcript of WWDC 2014 Session 225, What’s New in Core Data Reading a searchable transcript on a technical topic is so much more efficient than watching a video! Even if someone gives you a time marker in the video. However, you might want to watch the video too. It looks like there was only this one Core Data Session this year. Matthew Morey’s Top 10 List of Core Data Tools and Libraries. Number 2 in the list, mogenerator, contains some instructions for using mogenerator. Wolf Rentzsch’ mogenerator, a tool for generting Core Data model classes. Version 1.27, the current built binary download, does not support Swift, but supposedly the current trunk does and presumably 1.28 should. Watch out if you are using Xcode for non-Mac-App-Store builds. It may exclude more than you realize from Time Machine. As you can see, this setting was propagated into the Intermediate Build FIles Paths too. To the “naked eye”, all looks as expected. But wait. Let’s look at these directories' pesky Extended Attributes. Many years ago, when I worked for a company in a cubicle, after one of our many relocations, all of the engineers were busy rearranging our cubicles. You had a desk, a chair, a computer, a file cabinet, usually a storage cabinet and whatever else you wanted which you could “appropriate”. You were free to put these where you wanted. Some people were trying to be innovative, others copied. A wise engineer, older than me at the time, viewed the scene and remarked Yes, it’s hard to figure out the “optimum” arrangement. Maybe stay at home and have them send the check every month. He was great about saying stuff like that with a straight face. I feel the same way about apps on my iPad Mini, which I use mostly for reading music notation with forScore, but of course it’s a note pad and web browser too. I won’t do email on an iPad because I’m never far away from my MacBook Air, and I can type faster on a real keyboard. iTunes tells me I have 34 apps. I’d rearranged the apps once, “logically”, into three screens, but it never quite made sense. Today I decided it do it like I do my bookmarks - in alphabetical order. I am happy to see that a 5-years longstanding bug in TransformProcessType(), noted by Mike Ash, and earlier by others, has been fixed! • When our extension is installed into multiple user profiles in Chrome (which can be running simultaneously), each profile launches its own instance of our Messenger tool. Our NPAPI plugin required some careful accounting to avoid “crosstalk" in this case. • Because whatever goes into ~/Library/Internet Plug-Ins gets loaded into all browsers whether it needs them or not, our plugin uselessly loads itself into Firefox, Safari, etc., where it has no effect other than to waste the user’s RAM, and paste our good name into the Crash Report whenever one of these browsers decides to take a nosedive. Viva isolated processes! Of course, our extension installer will have installed this file. Most importantly, it contains the path to our new “Messenger” tool, a Command-Line tool written in Objective-C. We’re probably going to install that into our own ~/Library/Application Support folder. Knowing this path, Chrome launches an instance of our Messenger tool. Chrome communicates with its child messenger via unix stdin and stdout. It seemed like an odd choice for interprocess communication, until I realized that these big-name web browsers need to be cross-platform and run on old systems. They needed something ubiquitous. In the Messenger-to-Chrome direction, your Messenger similarly creates a similar command/parameter dictionary, serializes it object into JSON, (using for example, NSJSONSerialization), encodes it to data as UTF8, then gets the length of the data, prepends it to the JSON, and writes it to stdout. About 9 lines of Objective-C code if you’re verbose like me. Not bad. When Chrome completely quits, it apparently sends an end-of-file (EOF) to your Messenger. (I can’t see the EOF for sure because NSFileHandle probably swallows it, but I’m guessing this must be what happens.) Anyhow, when your messenger receives an empty stdin from NSFileHandle, it should terminate itself gracefully too. Or you can just wait for the system to kill it due to its parent process (Chrome) terminating. I’ve noticed one odd but probably harmless behavior and maybe beneficial behavior, which is that if Chrome is running with browser windows open in two different user profiles, and both have our extension loaded and consequently two of our Messenger tools are running, if you quit Chrome without closing the browser windows, then relaunch, two Messenger tools will launch, apparently one for each user profile, even though only one browser window opens (for the last-started user profile). Probably, Chrome re-opens two background.html pages, one for each profile which had a browser window open when Chrome was quit. If browser windows are closed first, then only one Messenger will launch, for the one browser window which opens. Native Message has a very nice, super-minimalist, low-level protocol. You define your own higher-level protocols with commands and parameters (Use JSON!). The design process is natural, and easily extensible; you can pretty much make it up as you go along. Update 2017-03-03. Firefox now uses the Chrome extension system, with this same Native Messaging. Future versions of our Firefox extension will use it. Safari extensions, unfortunately, still have so few capabilities that we’ve found no reason to bother writing one yet. has given incorrect information since Mac OS X 10.7 was released in 2011. As of this writing (2013-10-30), it is still incorrect. Let this blog post serve as an errata until they rewrite it. This method is depracated, no longer used and does not appear in the diagram. But more importantly, the timeline (colored rectangles) along the left side of the graphic indicate that these methods invoke one another in a conventional "stack". But that is not what happens any more. Since 10.7, some of these methods return and only later are the methods higher in the stack (actually more "rightmost" because the time axis on this diagram is downward) invoked by the "perform synchronous activity" magic. Sigh. The problem is that @INC is hard-coded into Perl to contain only system directories, and so the installers for third-party Perl modules that I’ve downloaded from the Comprehensive Perl Archive Network (CPAN) put modules that I need into these system directories, which are wiped by Apple’s installers when you upgrade Mac OS X.
and also I put all of the modules into that folder directly, foregoing the “5.10”, “5.12”, “5.16” etc. subfolders. It doesn’t make any sense to me that these modules are associated with specific Perl versions. I’m only running one version of Perl, and if I need to update a module, I need to update a module. Old versions of modules, if that’s what those folders are for, don’t do me any good. Got a little surprise today after upgrading to the public release of Mac OS X 10.9 Mavericks, which we hadn’t noticed in Apple’s beta builds. BookMacster is configured on my Mac account to sync several browsers including Safari. After a few minutes, possibly triggered by my responding affirmatively to take the Mavericks Tour, BookMacster squawked that syncing had been stopped because too many changes were coming in from Safari. Taking a look, I found that, by golly, there were a couple dozen new bookmarks and two folders named News and Popular in Safari’s Favorites Bar (formerly called the Bookmarks Bar). There were bookmarks to Apple, iCloud, Facebook, Twitter, etc. Apparently what happened is that Apple decided to repack my Favorites Bar with Safari's default bookmarks. These are bookmarks that I don’t want. (If I’d wanted them, I would already have them.) Then, BookMacster’s Safe Sync Limit stepped in and duly did the right thing. BookMacster saw all of these new bookmarks trying to come in, stopped, and told me that something was suspicious. The Sparkle framework is built with an INSTALL_PATH set to @loader_path/../Frameworks. This works fine when Sparkle is embedded into an app or a plugin, but not if you're embedding Sparkle inside of another framework, as a "sub" framework. The short explanation is that @loader_path is referenced to the executable inside the package, so the path from it to its target depends on the directory structure of the hosting app, plugin or framework. The directory structure of a plugin is the same as that of an app, so it "just works", as explained in the ld man page. But a framework is different, so it needs a different path. 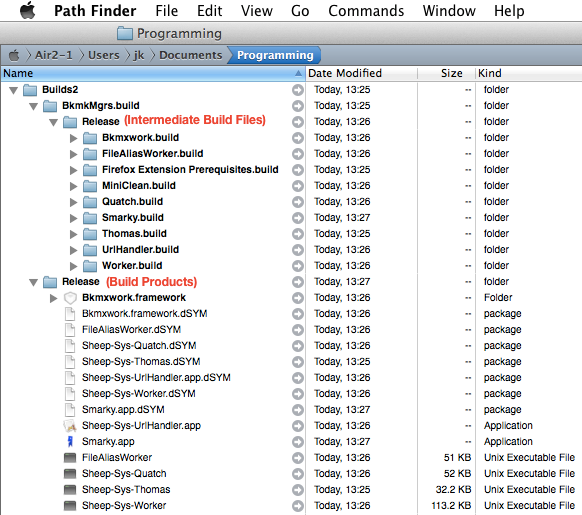 because the @loader path is MacOS, the .. is Contents, and Frameworks is, nicely, a subfolder of Contents. However, embedding Sparkle into another framework is different because of the different directory structure. I've recently needed to publish a website with streaming audio and was surprised how difficult it was to find code which would work on all computers, tablets and smartphones in year 2012, and also the number of professionally-designed websites which fail in this regard. The answer appears to be in this W3C Schools article. The short version is: Use HTML5 <audio> backed by mp3 + ogg. Sorry, your browser does not support this audio stream. In the code (Show Page Source), please note that you must provide two audio files, .mp3 and .ogg. This is because, for some reason which a mere mortal electrical engineer cannot understand (probably involving patents or not invented here), Firefox (by my testing) and Opera (according to the aformentioned article) cannot play mp3 files. But, lo, they can play ogg files. Conversely, the other browsers seem able to play mp3, but not always ogg. There are other file formats which are supported by various browsers, but it seems that the combination of mp3 + ogg is the smallest combination which will work in all browsers. I spent some time yesterday improving our Trouble Zipper AppleScript package. It now finds crash reports generated by Mac OS X 10.7 and 10.8. (Apparently, we haven't needed to look at many crash reports since 10.7!) Also, using a new Perl script in the package (filterConsoleLogs.pl), the filtering of console log entries for those written only by a target app now gets all lines of multi-line entries. The AppleScript source, and other useful scripts and tools in the package, are all open for any other interested developers to dig in to. Unfortunately, if your app is sandboxed, you may not be able to allow your users to download and run such a Trouble Zipper from the Help menu in your app, as BookMacster does. But if you can figure out a way to deliver it to your users, you might want to download Trouble Zipper, tear it apart, and use whatever you like. Oh, but, Apple gave us one more annoying surprise in Mountain Lion. The applet executable in Trouble Zipper's Contents/MacOS/ subdirectory is a triple-fat binary: x86_64, i386, and ppc. AppleScript Editor in Mountain Lion will not open it, apparently because it does not like the PowerPC (ppc) architecture in the applet. And in characteristic Apple oversimplified style, the error dialog simply says that the script cannot be opened. If you don't need to support any more PowerPC users, you can fix this problem by swapping in the applet from any other AppleScript application package you have. Or, you can work around it by opening Contents/Resources/Scripts/main.scpt inside the package, instead of the package itself, and editing that. AppleScript Editor will occasionally give you some crap about not being able to save the file because another app has modified it. Just click Save Anyway. Also, before testing or shipping, you'll need to manually click Compile before Save. It's been said that all jobs are difficult in their own way. Even though I rarely eat at restaurants, I respect the people who work there. 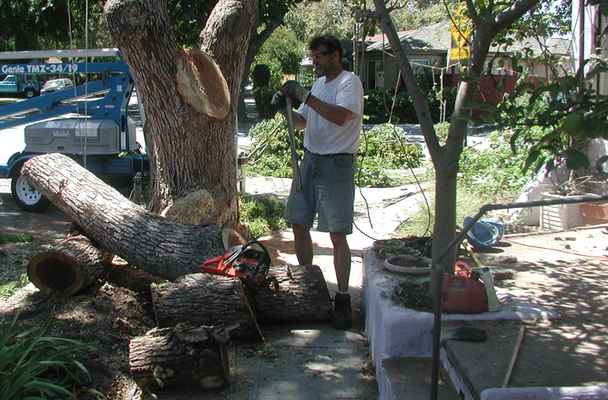 Trimming trees can involve some complicated mechanical engineering, especially in predicting how branches are going to fall when working in urban areas where life and property are at stake. Engineers designing products can run computer simulations and build prototypes before cutting into production. Tree trimmers contemplating a cut like this one that David Henschel did in front of our house yesterday can do neither. You only get one chance, and the only tools available are experience and luck. The shorter pieces were cut from the lift, but the long piece, was one cut made from the grouond. Wow. It came down with only a few bent trackers in the chain. What in the world does that mean? After a few seconds I guessed what they meant by content, then activated the engineering side of my brain, and visualized it moving as described. "Oh, oh! Now I get it." Apparently I had skimmed over that checkbox, thinking that since it was so complicated it must not be what I was looking for. When I lived in Warren, Michigan in the 1970s I would rotate commuting by automobile, public bus or bicycle. My safety rule for snow was: No bicycling if more than one inch of fresh snow. During the 1990s I visited Boston and was amazed to see bicyclists older than me commuting in any amount of snow. But I've learned, more than once, that we have a winter slide here in San José, California too. I've had to, since I no longer own an automobile, and public bus rarely goes where and when I want to. The worst months for it are: November and December. It's fallen leaves mixed with rain. Being aged now, I'm more careful – during our first winter storm(*) a few weeks ago, I was actually too careful and skidded down while stopping for a motorist coming out of a driveway who had probably already seen me and was waiting. Thanks to Easy Racer's recumbent bicycle technology, I only got a skinned elbow that was very sensitive for a few weeks, instead of another broken collar bone. No incidents occurred during my commute to or from the Haines Swim Center in Santa Clara this morning.